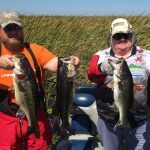 www.okeechobeejust4bass.com was fishing Lake Okeechobee today with Juakaen Dimas and his buddy, Matt. This was a wild three day adventure of fishing for 8 hours a day. We caught a lot of fish with wild shiners. Here is a picture of just a couple of the fish they caught.